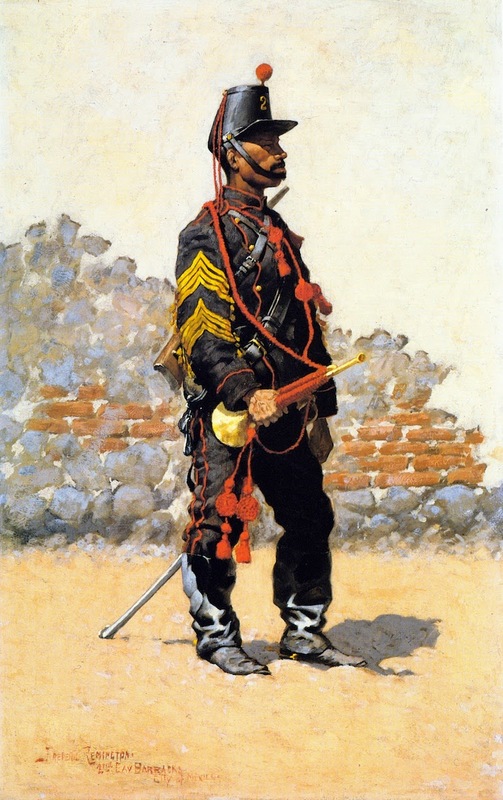 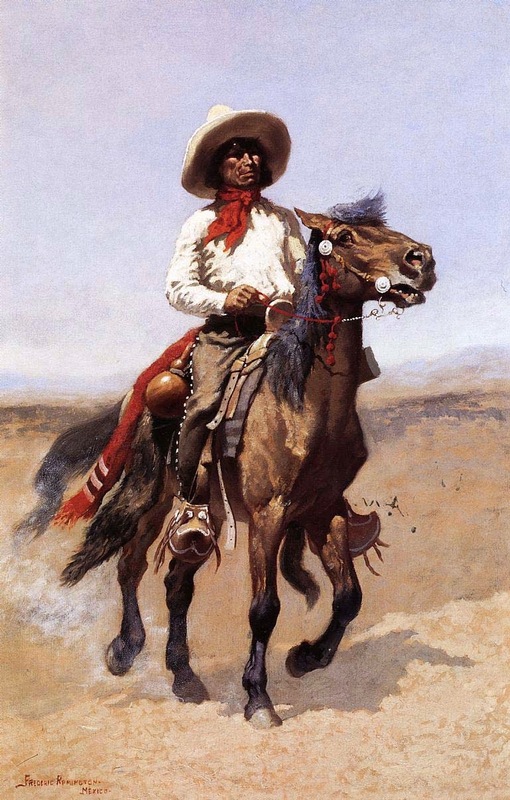 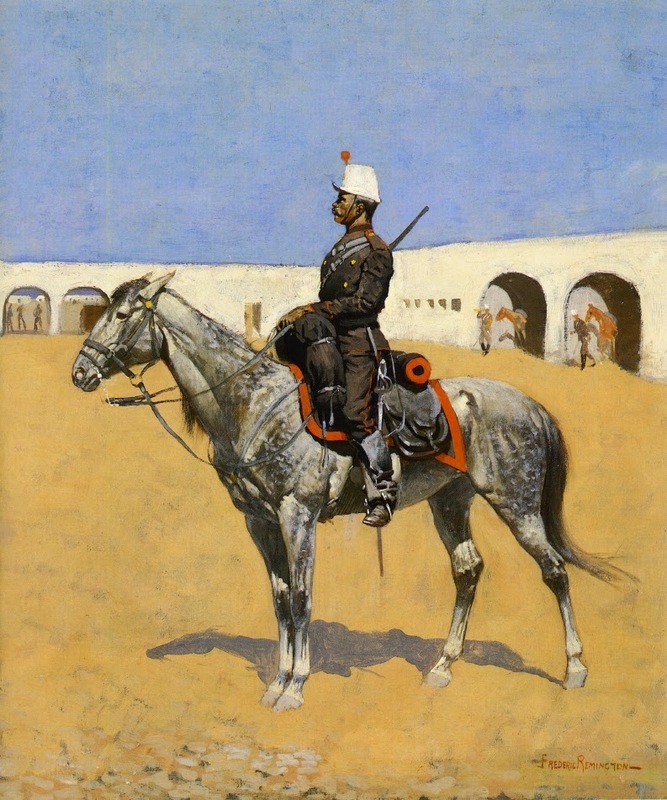 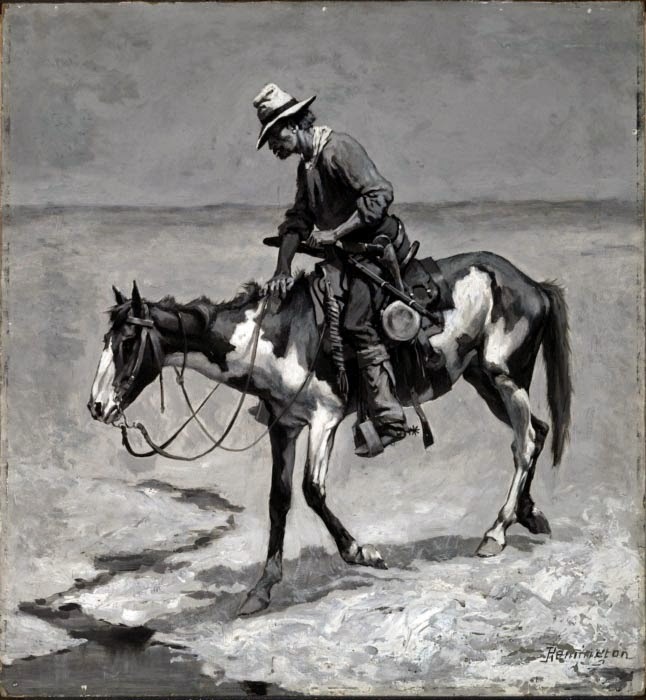 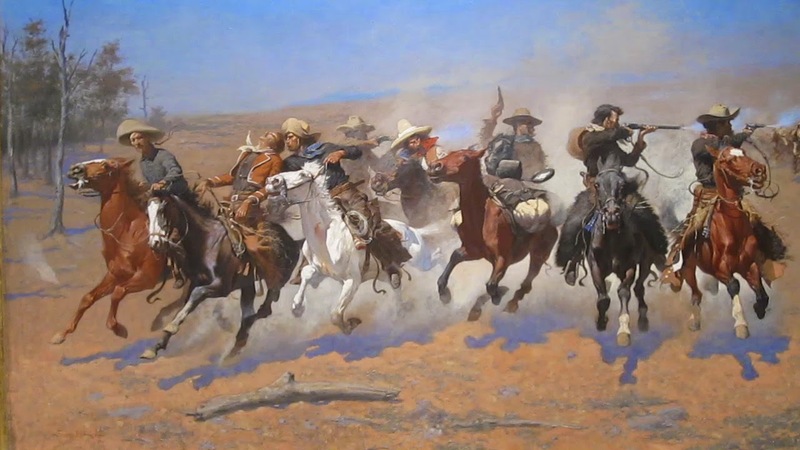 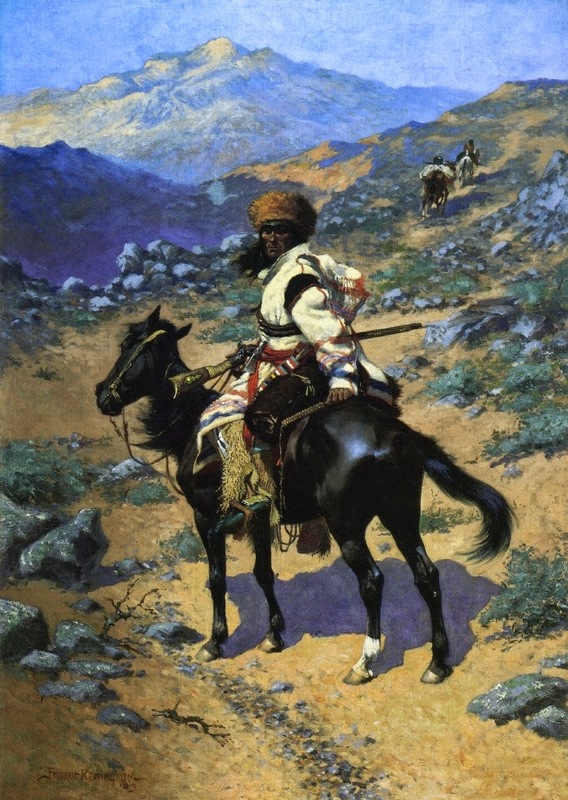 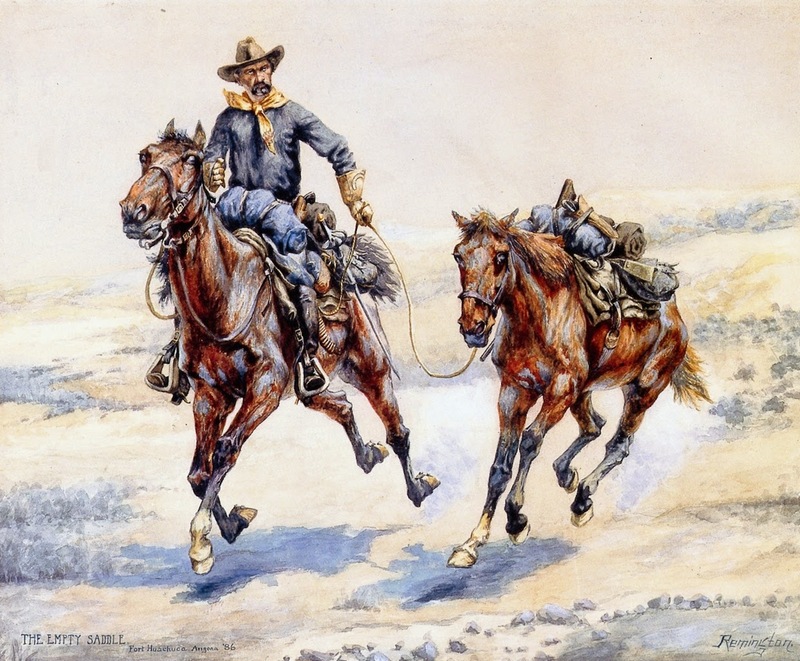 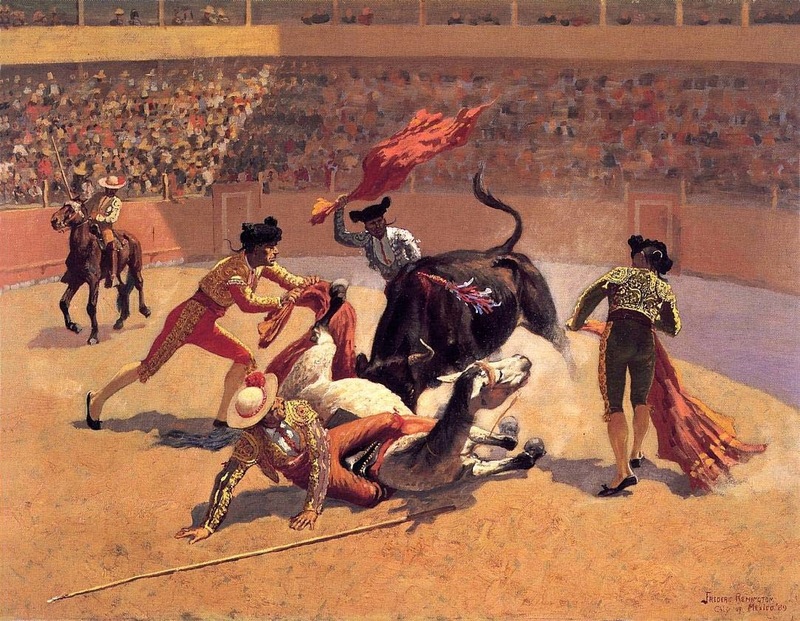 Frederic Sackrider Remington (1861 – 1909) was an American painter, illustrator, sculptor, and writer who specialised in depictions of the Old American West featuring depictions of Cowboys, American Indians and the U.S. Cavalry. 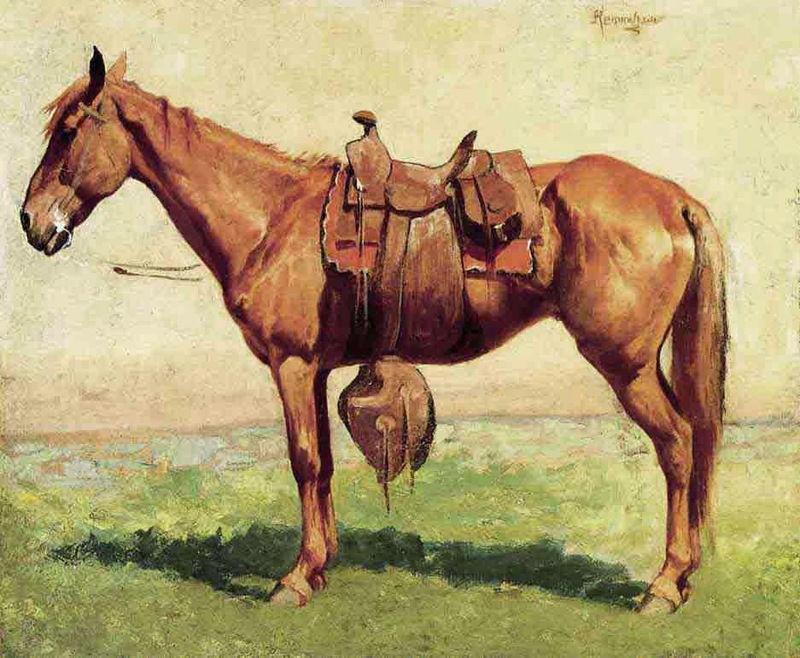 Remington was born in Canton, New York in 1861. 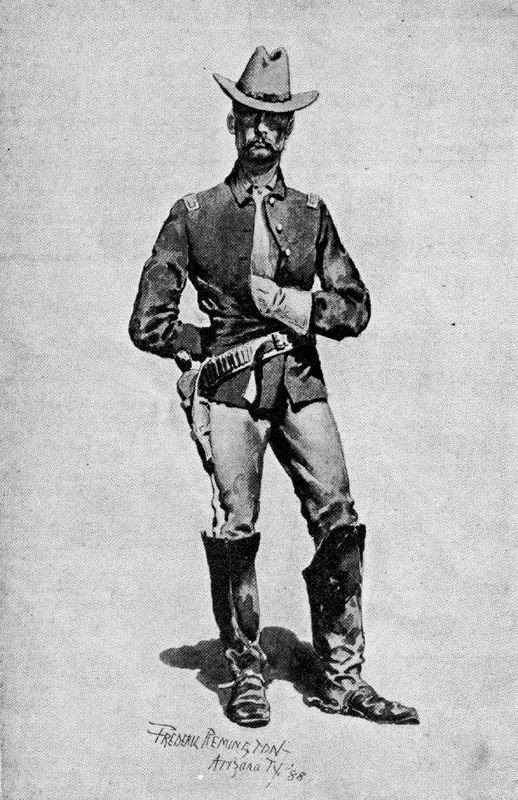 Remington’s father, Seth Pierre Remington, was a colonel during the Civil War. 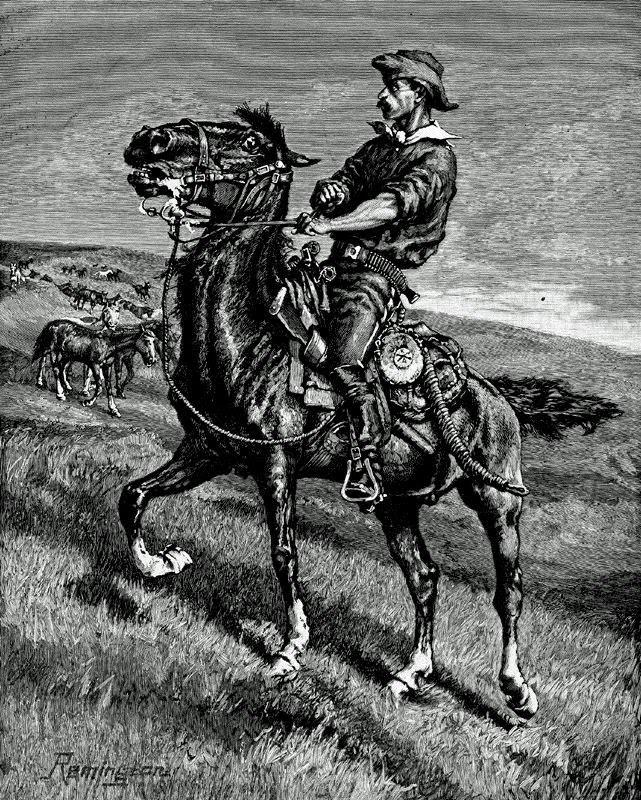 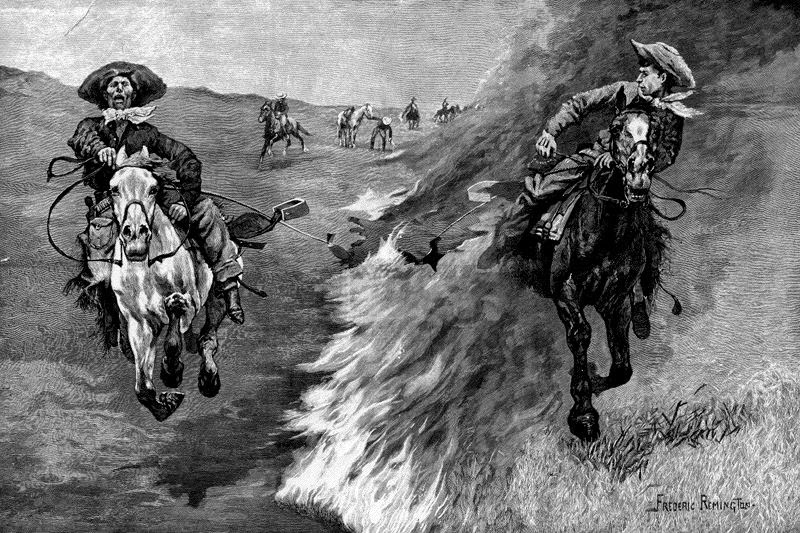 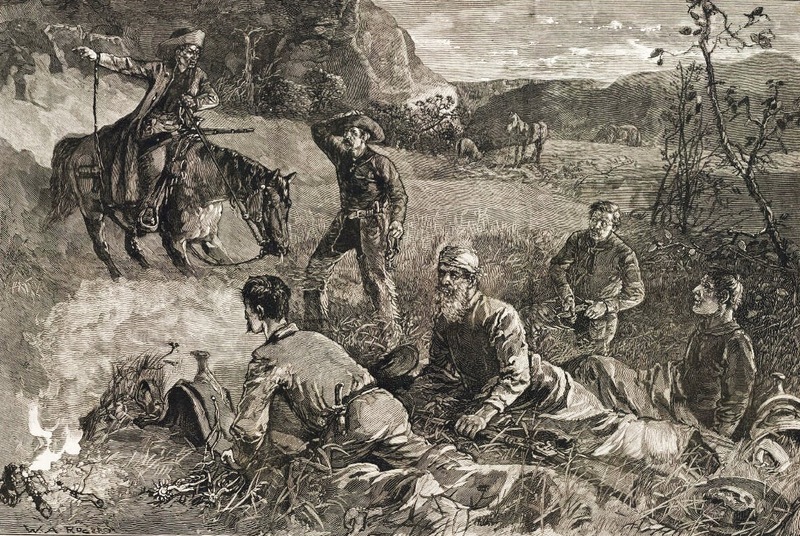 Colonel Remington was away at war during most of the first four years of his son’s life. 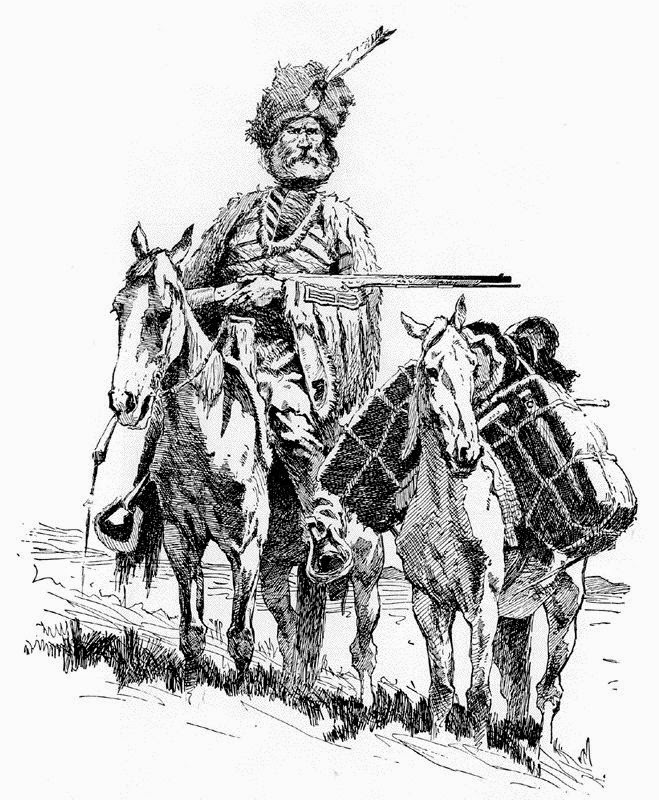 After the war he moved his family to Bloomington, Indiana, but the family returned to Canton in 1867. 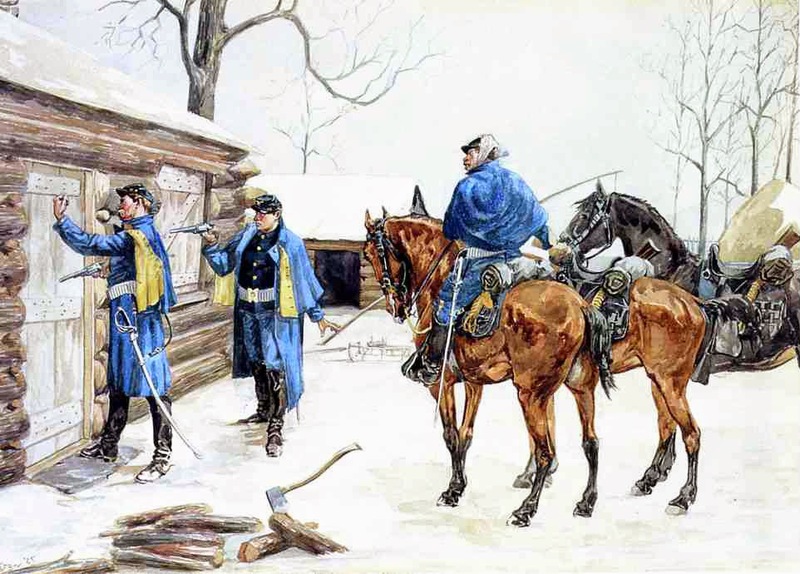 The family moved to Ogdensburg, New York when Frederic was eleven, where he attended Vermont Episcopal Institute, a church-run military school, before transferring to another military school. 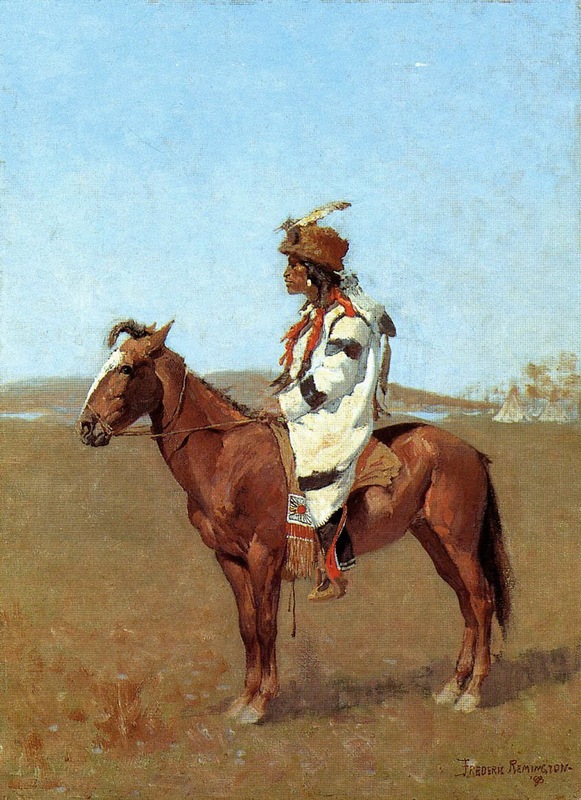 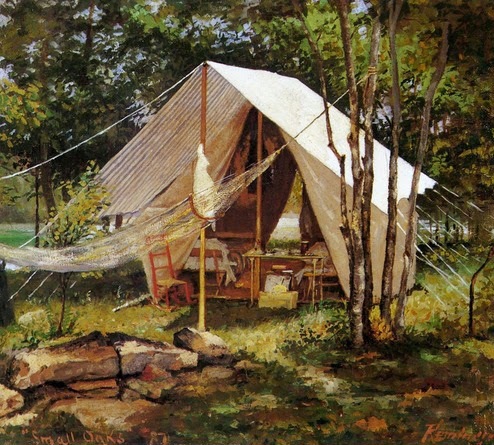 Remington went on to the art school at Yale University, studying under John Henry Niemeyer. 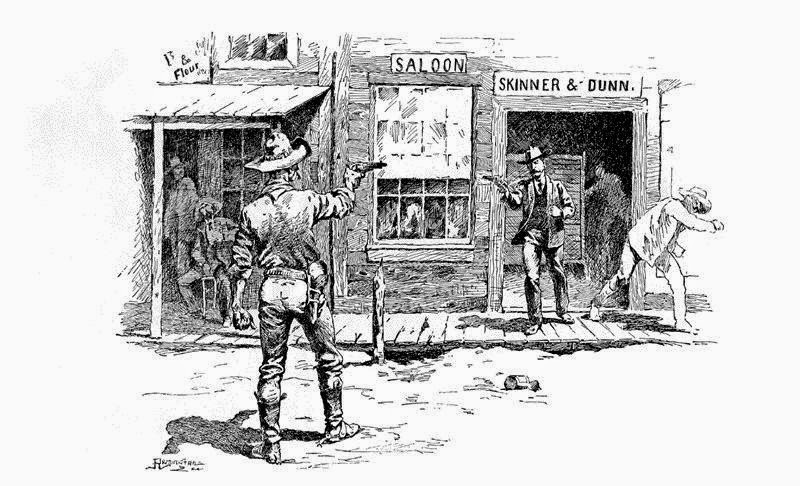 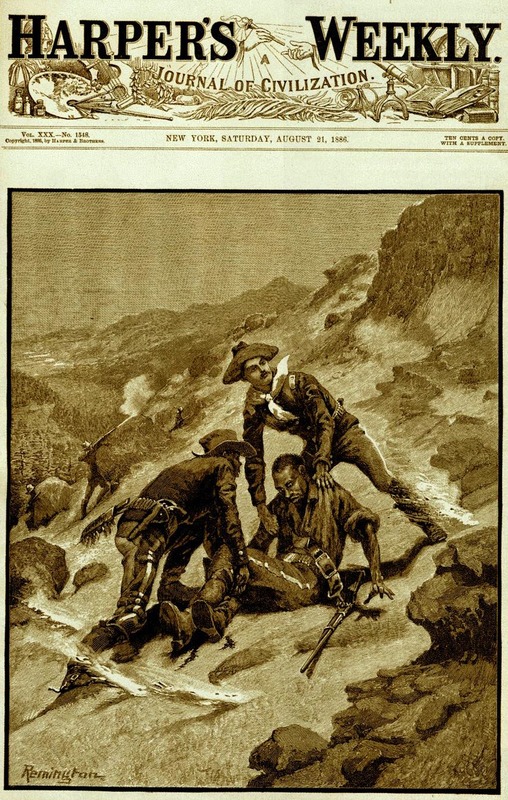 After the death of Remington’s father, his uncle secured a clerical job for his nephew in Albany, New York, and later became a reporter for his uncle’s newspaper, followed by a series of short-lived jobs. 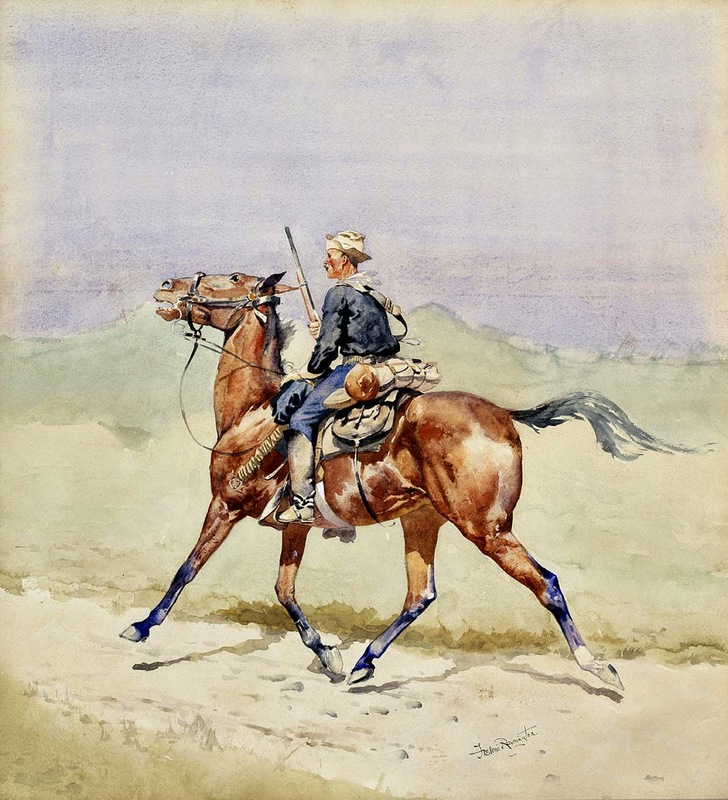 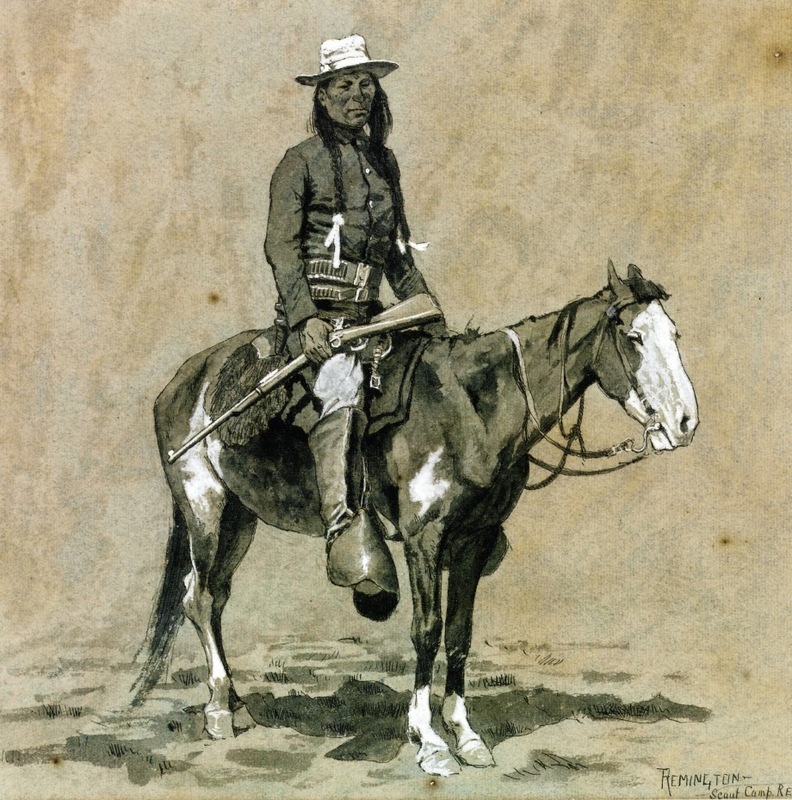 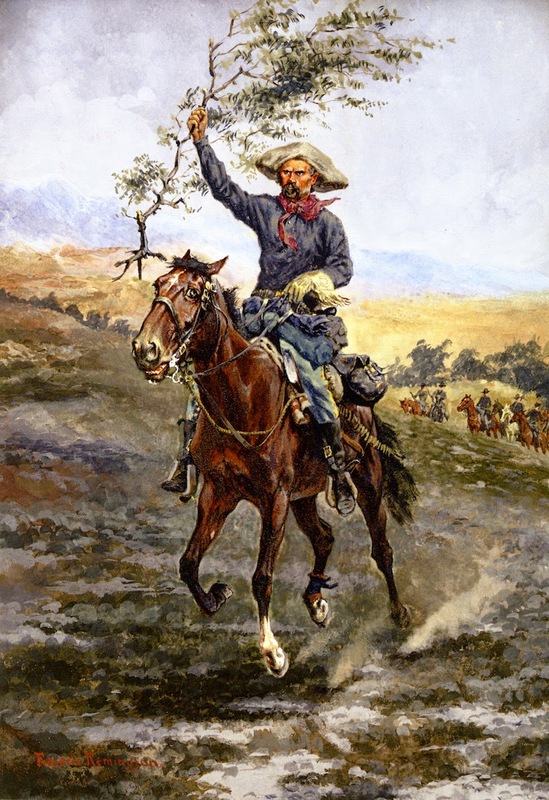 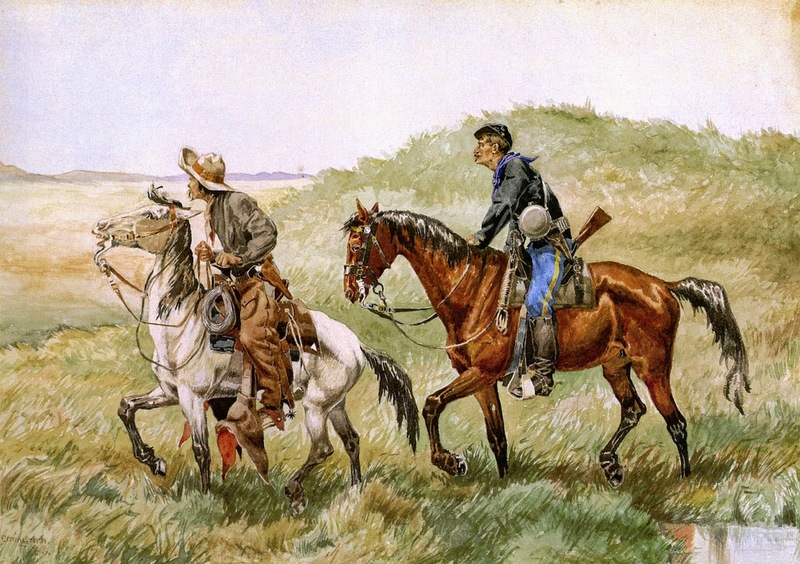 An inheritance from his father enabled Remington to travel frequently to the West, and he quickly developed a love of the fast disappearing world of Cowboys and Indians. 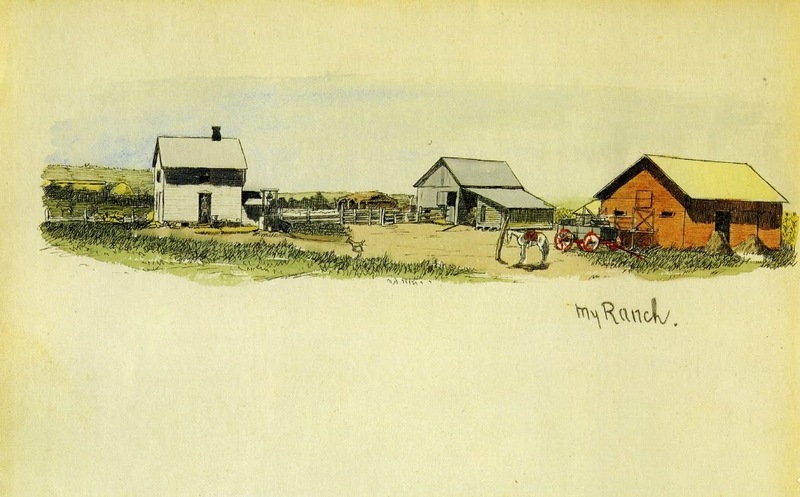 He eventually purchased a sheep ranch near Kansas, endlessly making sketches. 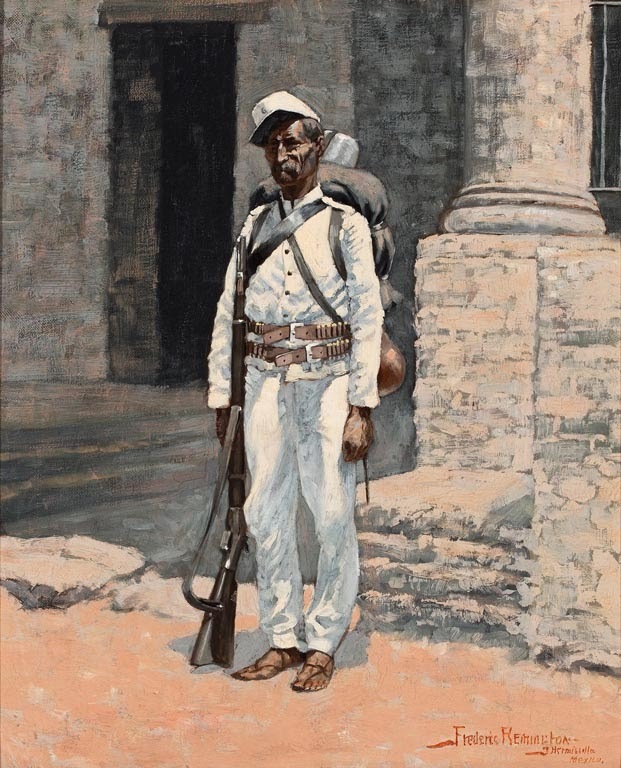 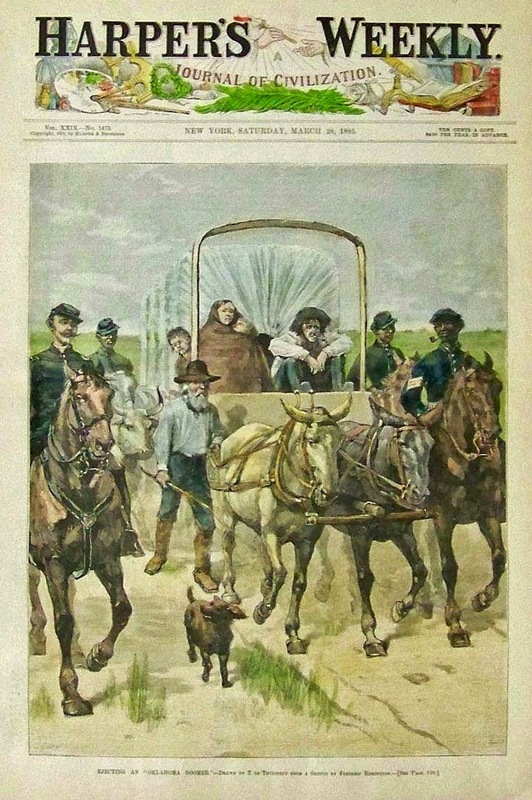 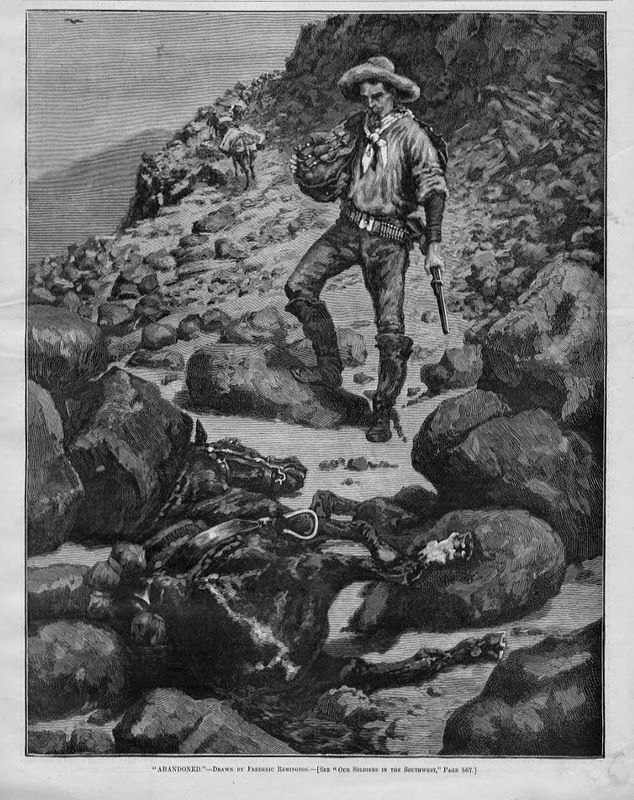 In 1884 he sold his first sketches based on his western travels, and within two years his first fully credited illustration appeared on the cover of Harper’s Weekly. 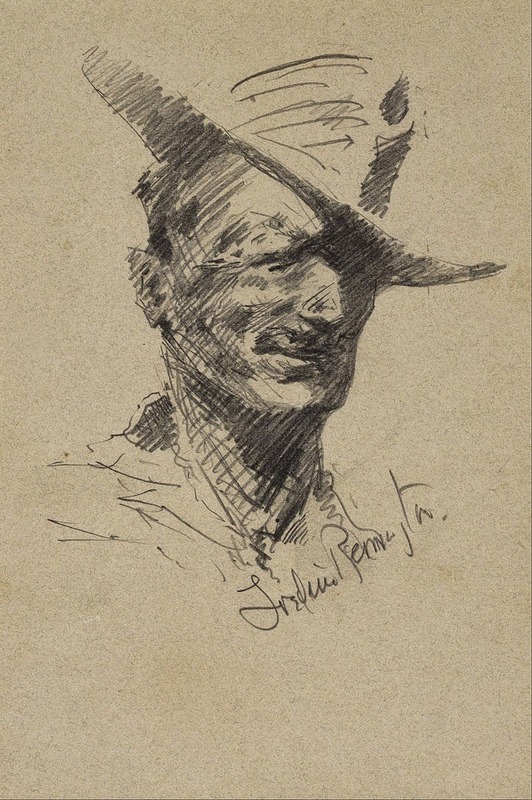 His popularity as an illustrator continued to grow and he returned to New York to satisfy the largely eastern market for his work. 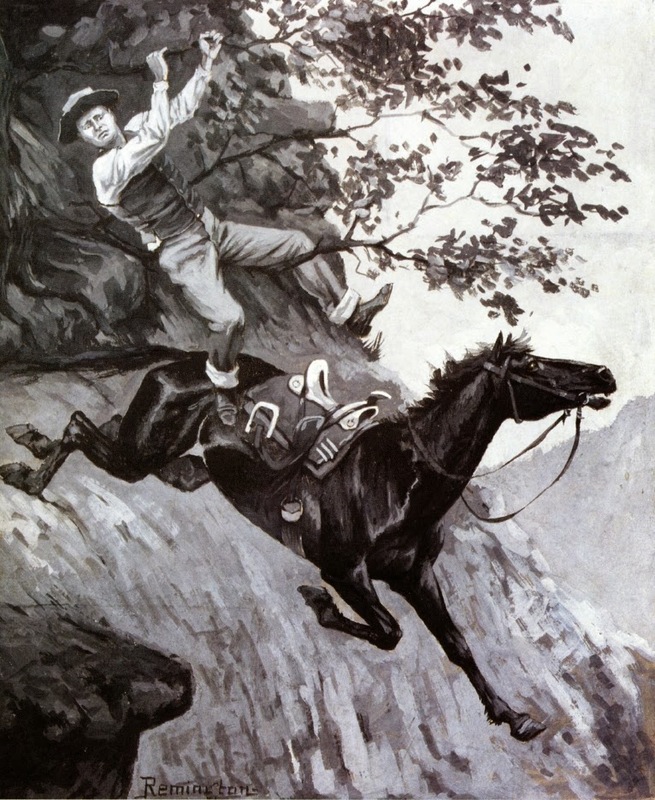 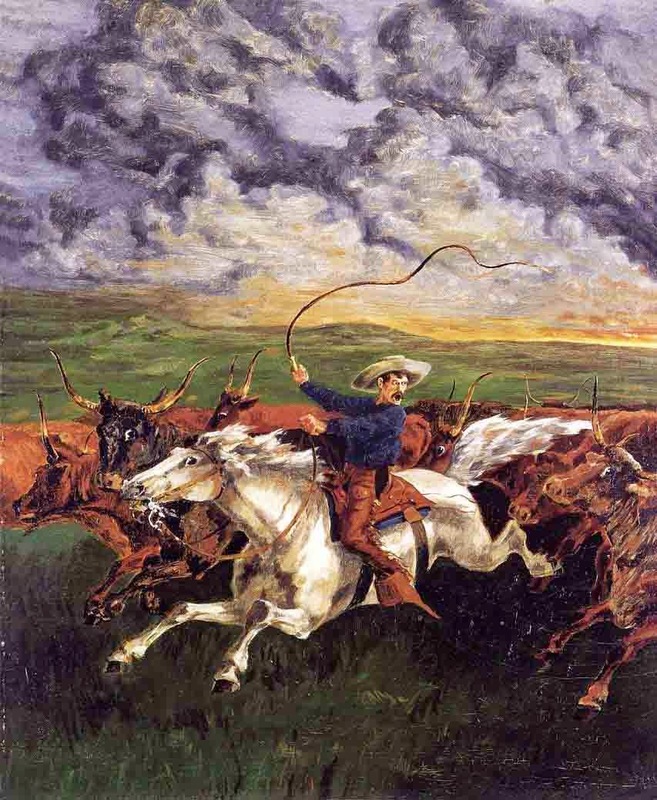 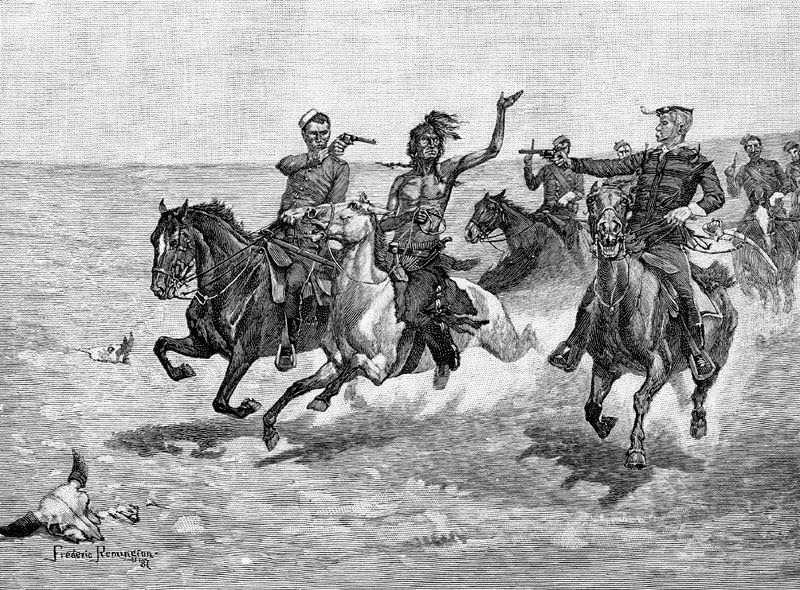 An 1885 Harper's Weekly cover "Ejecting an Oklahoma Boomer"
Remington’s output was enormous, creating more than 2,700 sketches, paintings, and published illustrations. 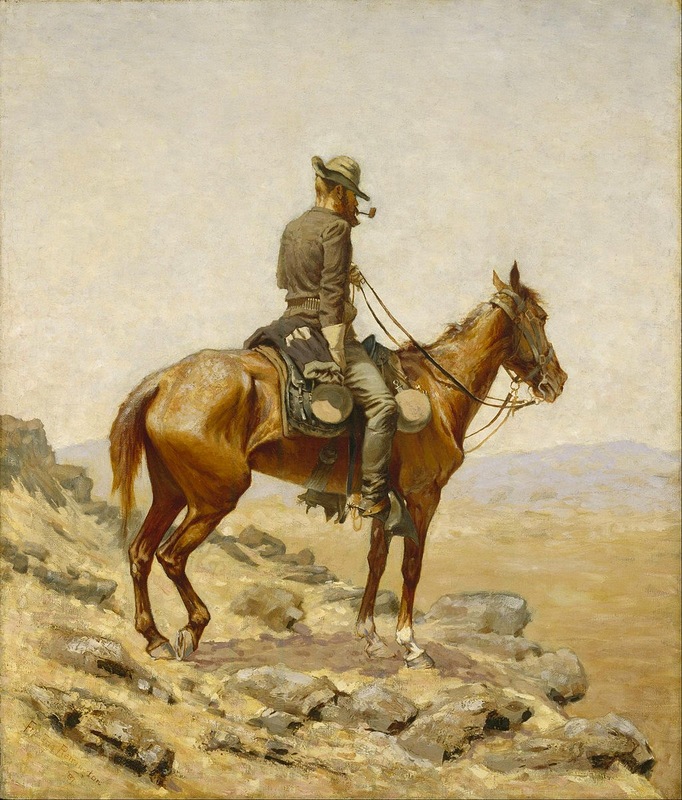 He died in 1909 from acute appendicitis, leaving a body of work loved by the public but largely ignored by museums and collectors. 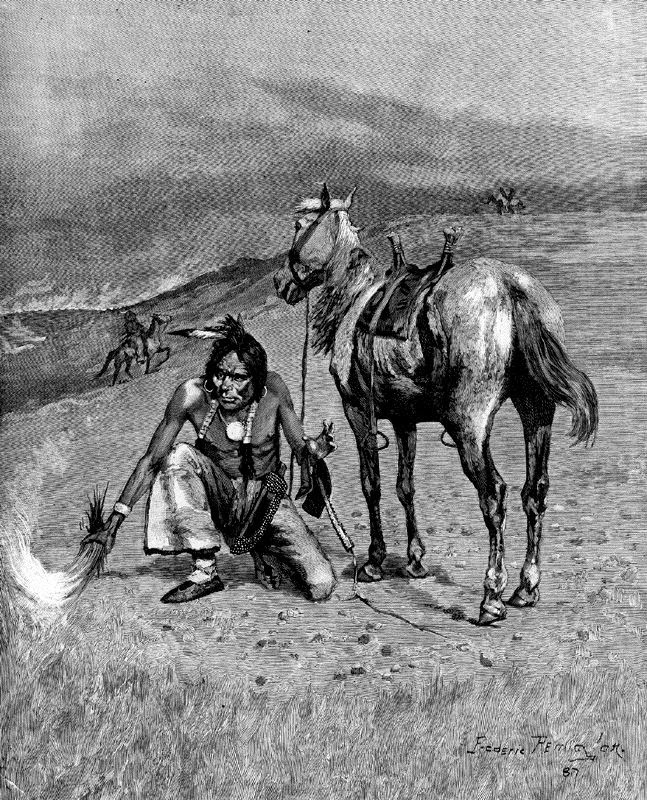 However, his reputation continued to grow and his work became sought after. 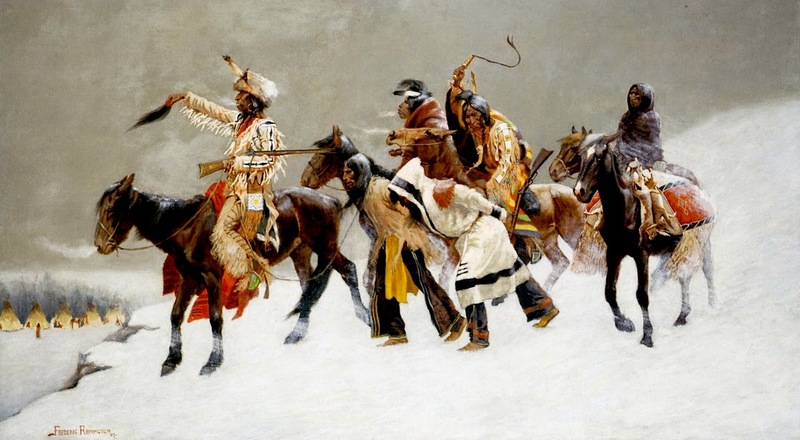 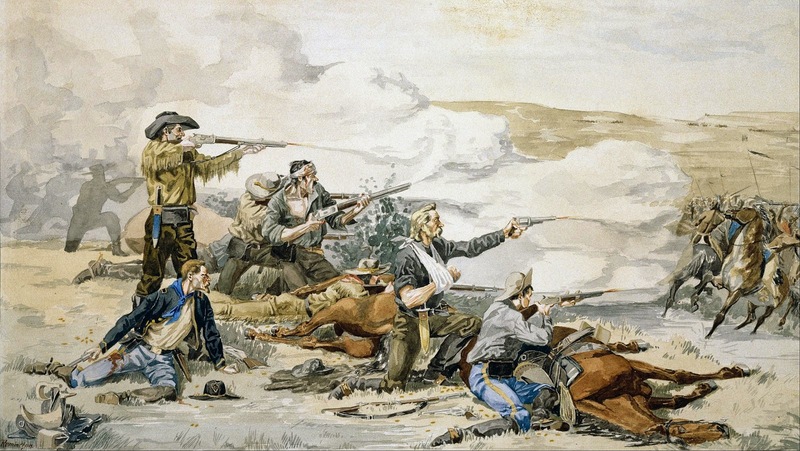 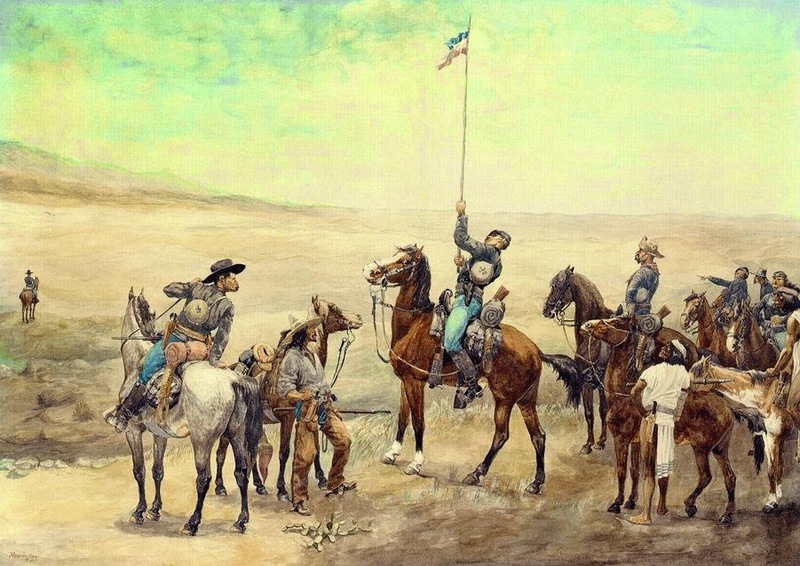 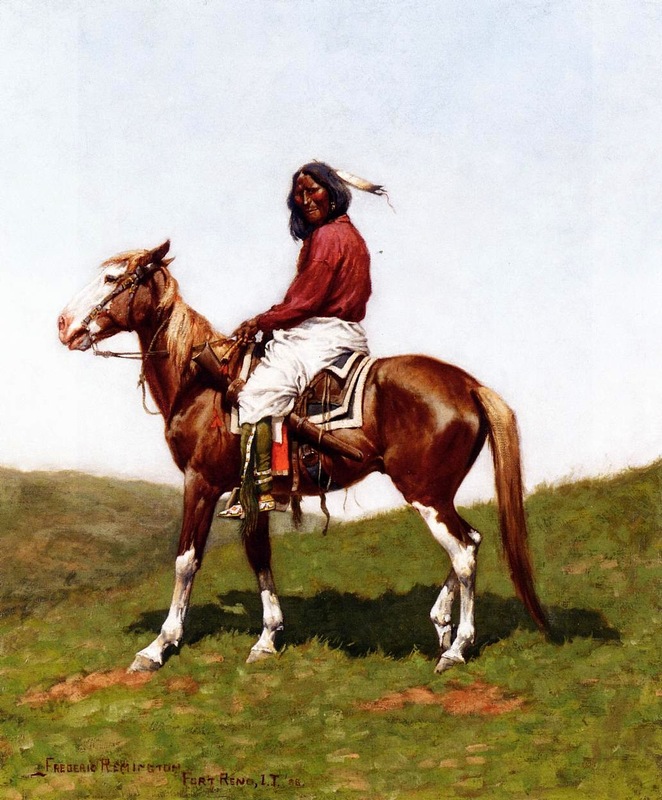 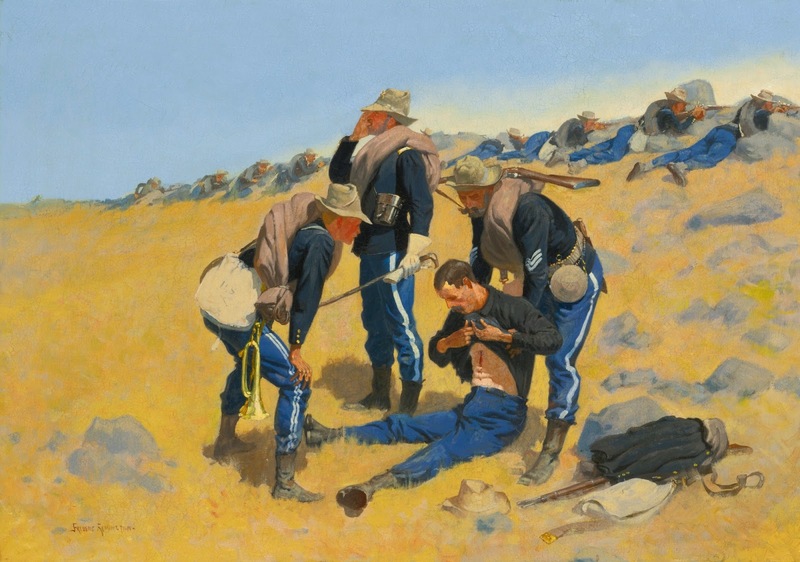 Prominent museums like the Buffalo Bill Historical Centre in Cody, Wyoming, and the Thomas Gilcrease Institute of American History and Art in Tulsa, Oklahoma have created large permanent exhibitions of his work. 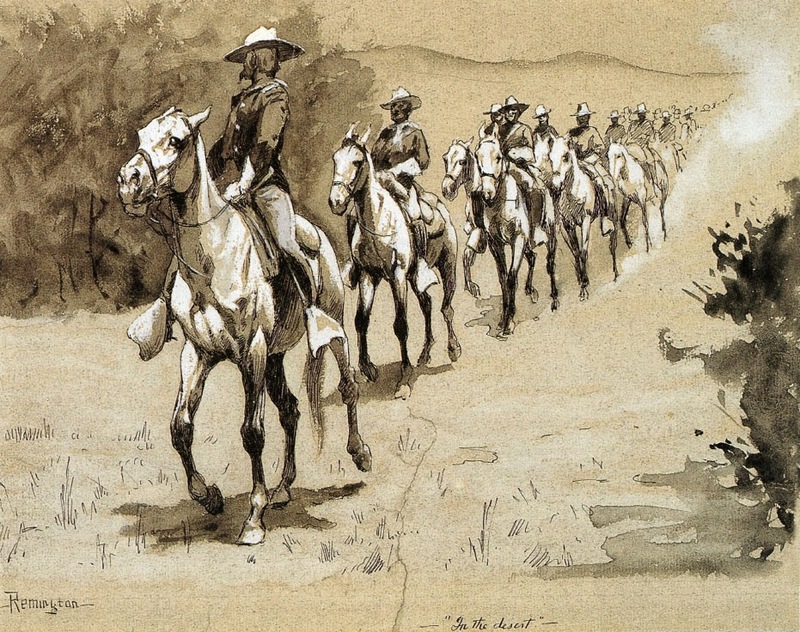 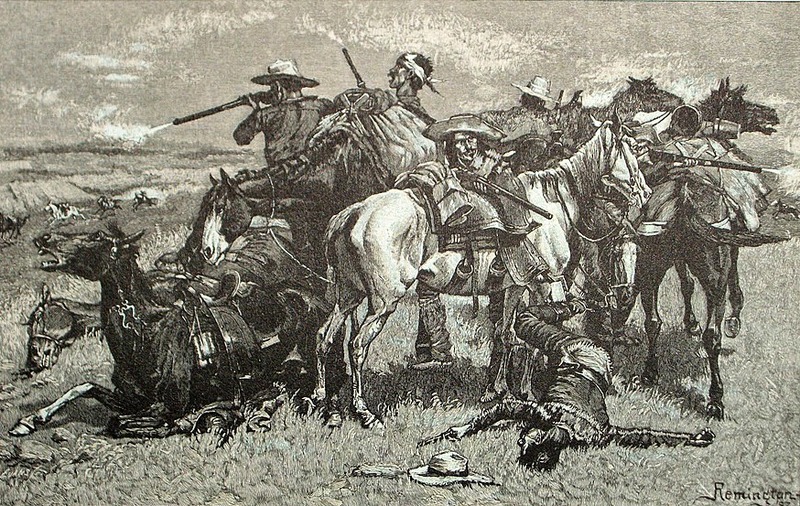 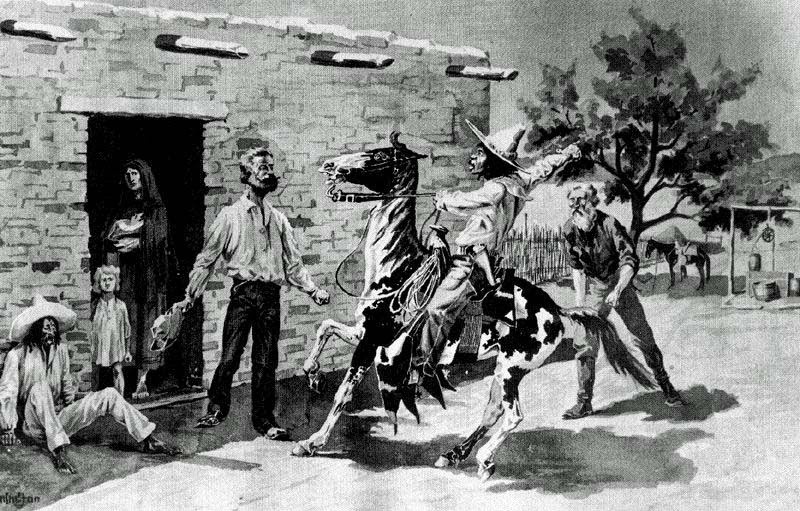 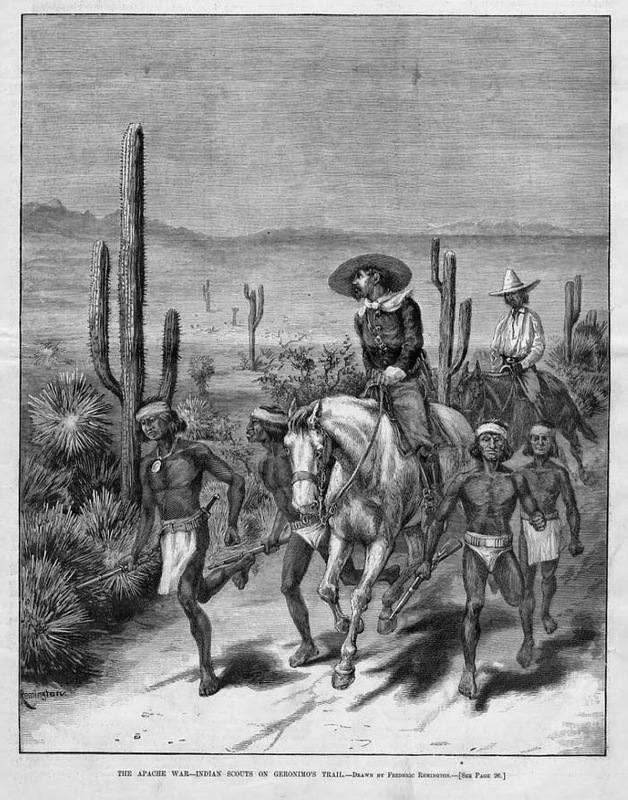 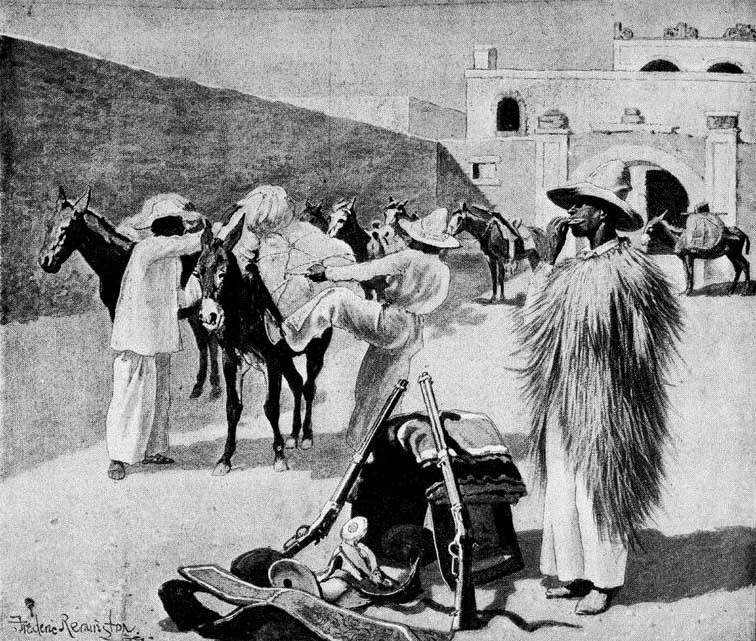 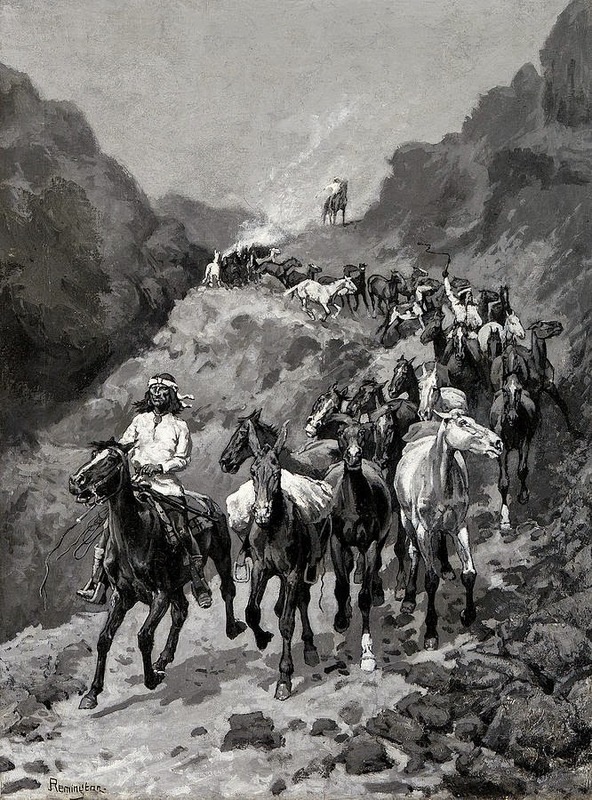 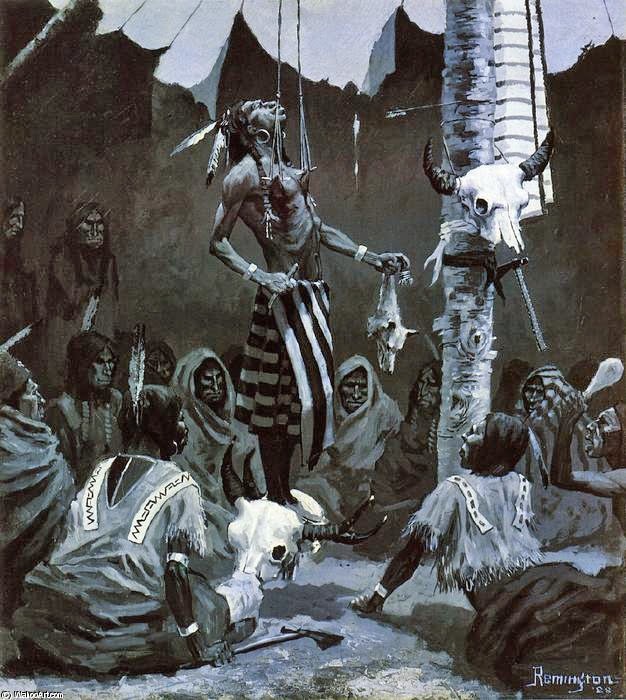 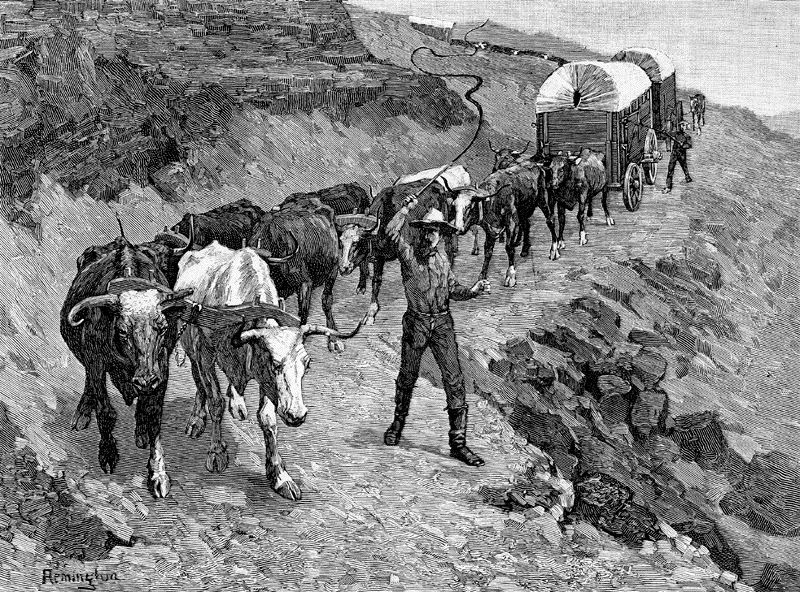 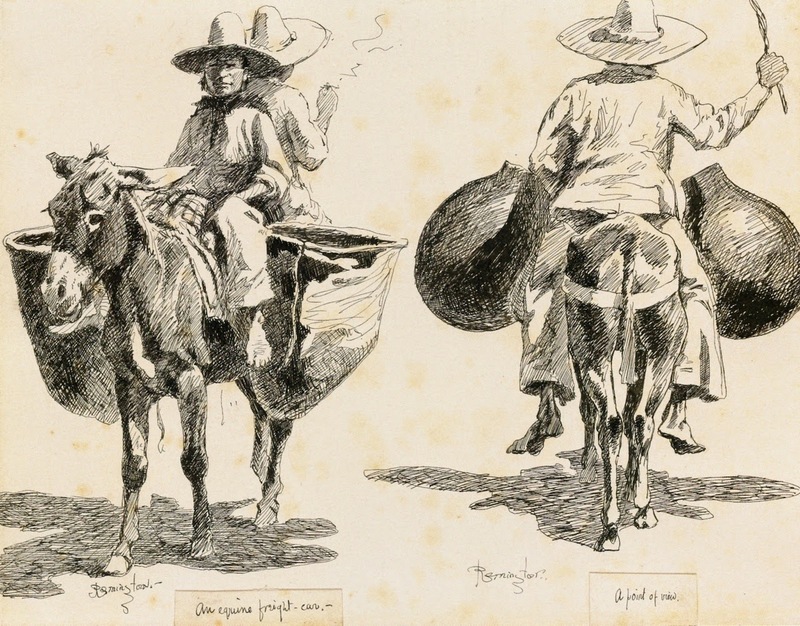 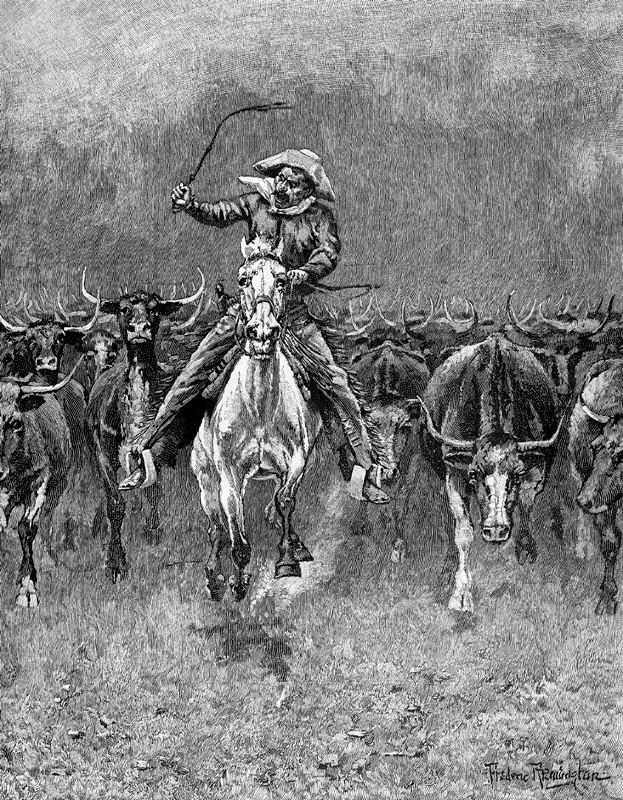 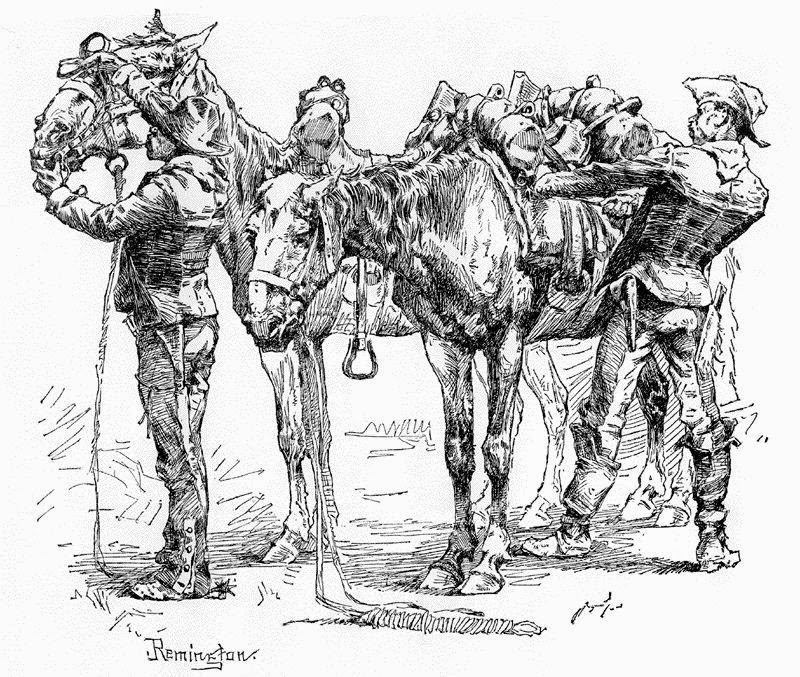 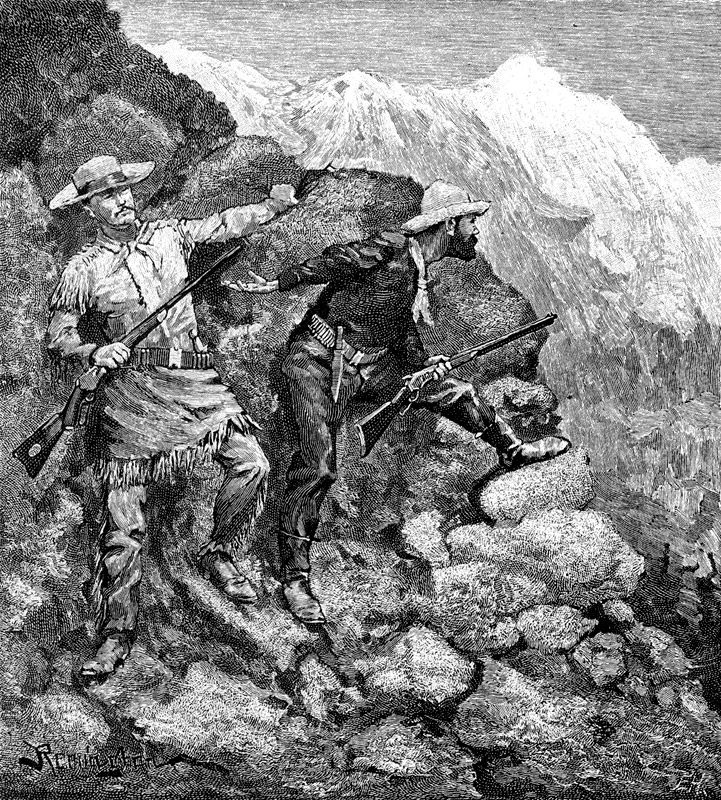 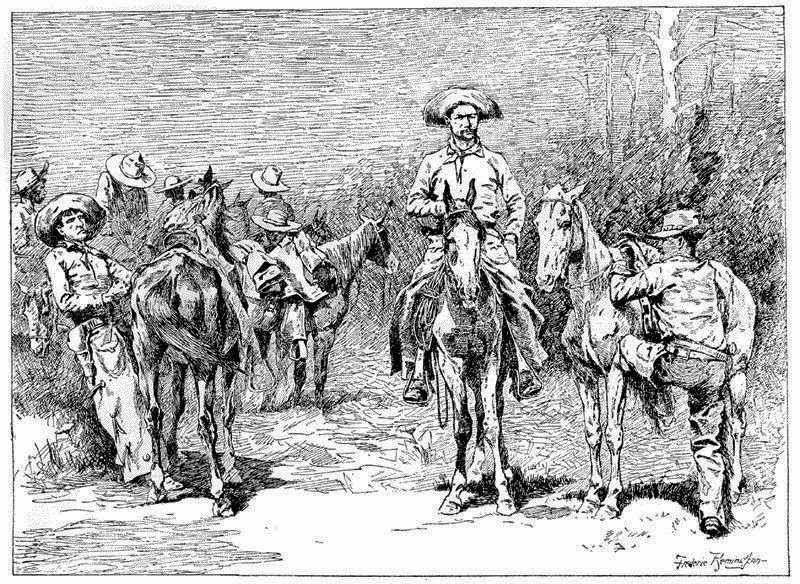 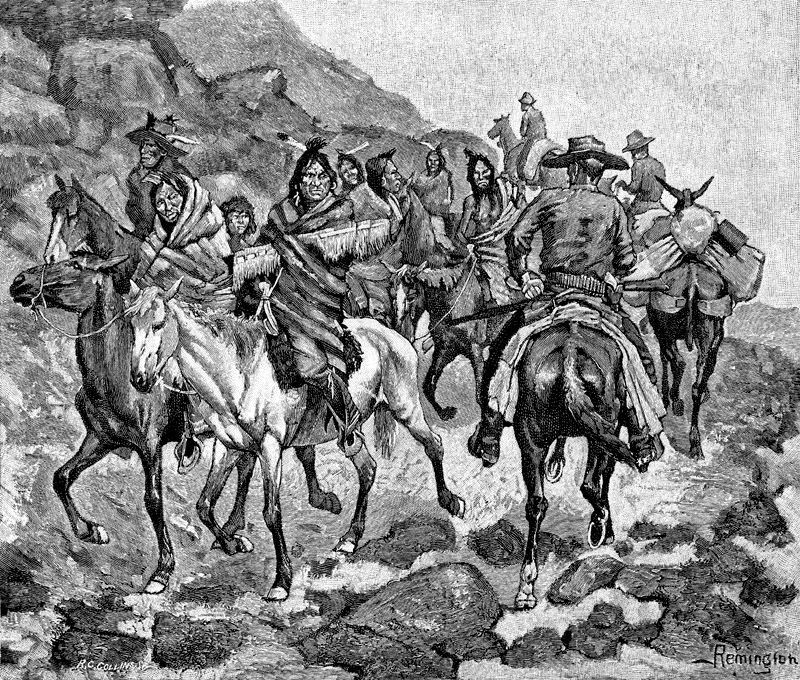 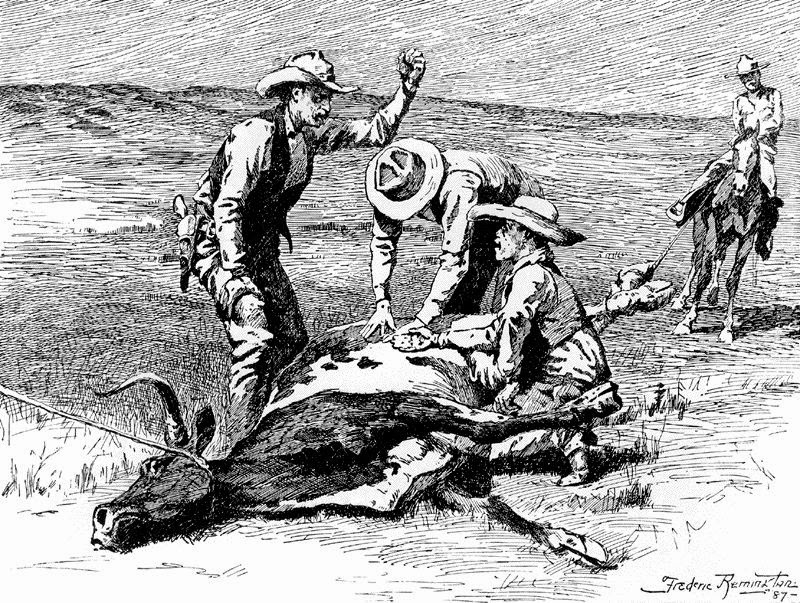 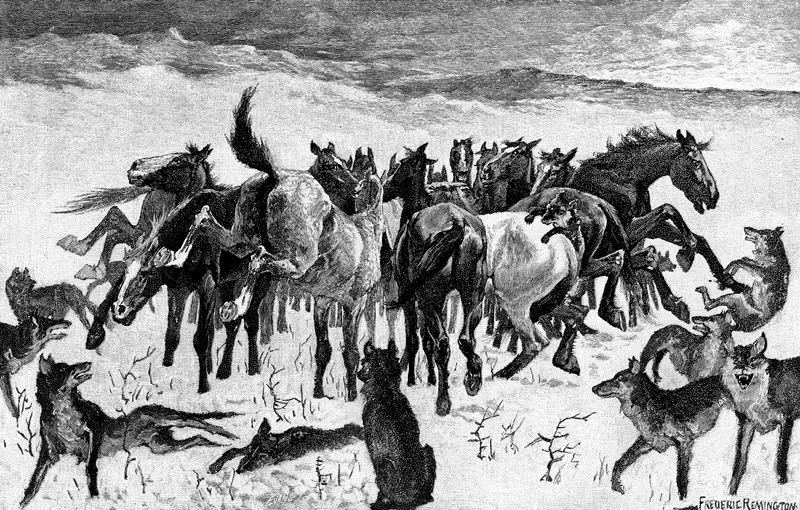 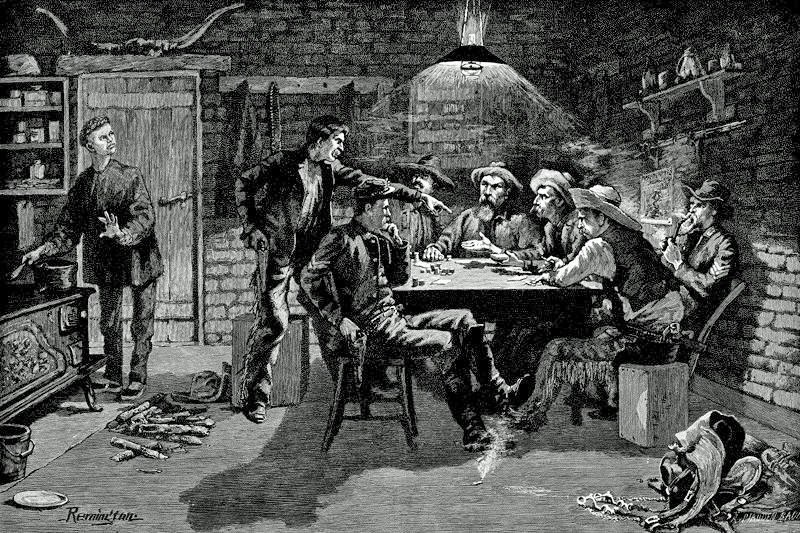 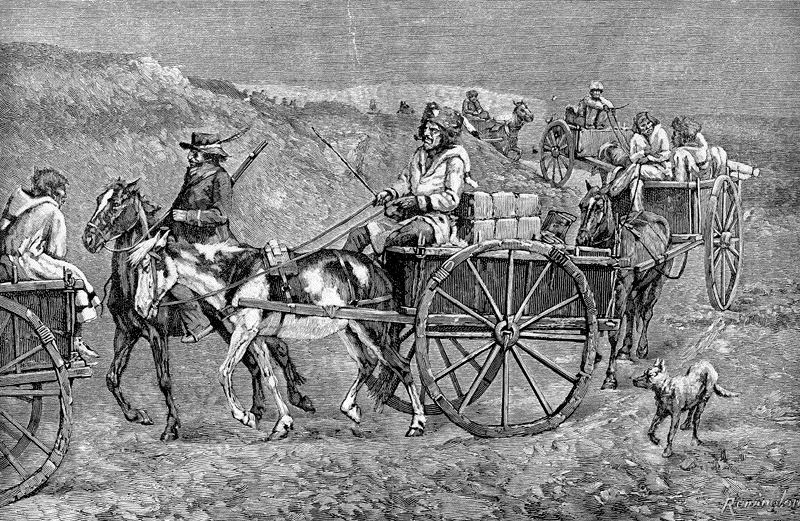 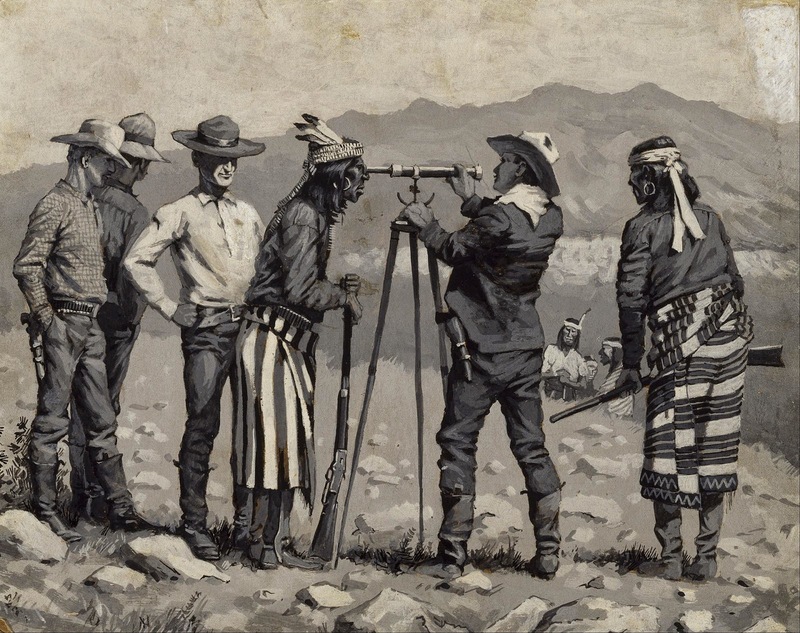 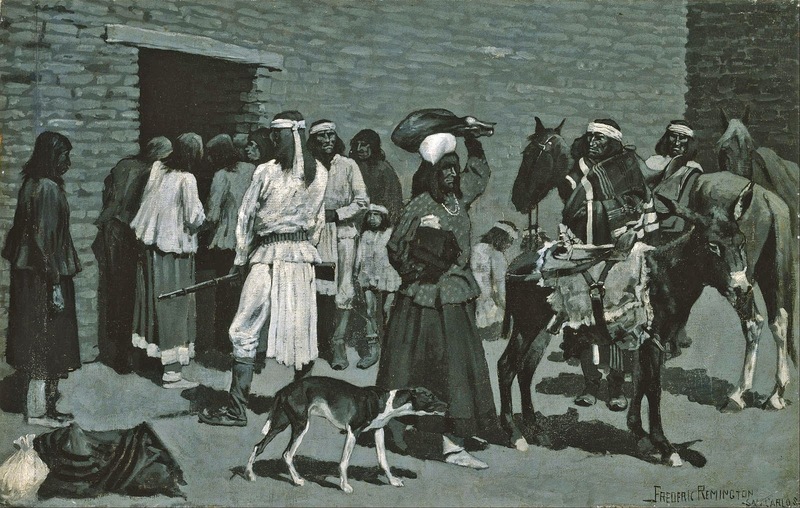 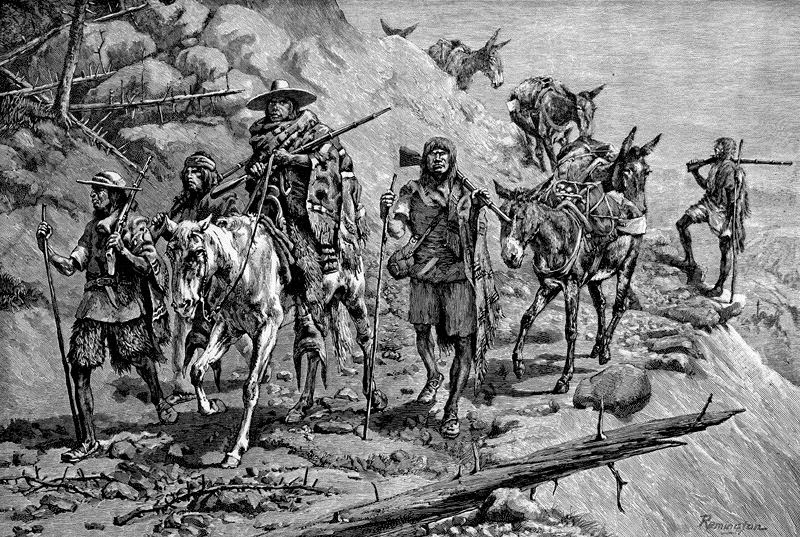 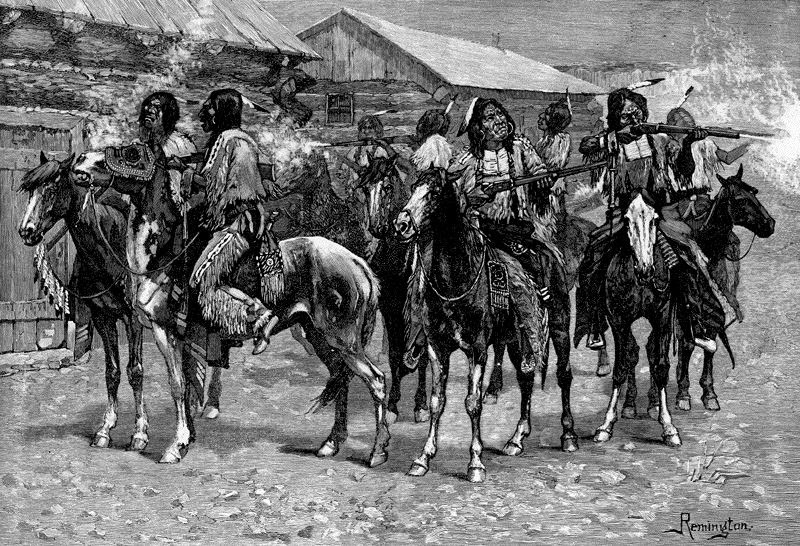 1885 Illustration for the Harper's Weekly "The Apaches Are Coming"
1889 "We Packed Our Mules in the Corral of the Hotel"